The value of higher education has been under attack as seldom before in American history. We are told of the overeducated American, of the case against college, and of the failure of education to contribute significantly to the reduction of inequality. In this environment, republication of an exceptionally comprehensive and judicious analysis of all that has been learned-and not learned-about the consequences of American higher education comes at a most appropriate time. Investment in Learning more fully covers the various aspects of this subject than any yet to appear. Howard Bowen is optimistic about higher education, but his viewpoint is based on profound knowledge of both the economic and social aspects of education. Unlike some economists who insist on a strict cost-benefit analysis of expenditures on higher education in relation to outcomes, Bowen argues that the non-monetary benefits are far greater, to the point that individual and social decisions should be made primarily on those broader indicators. 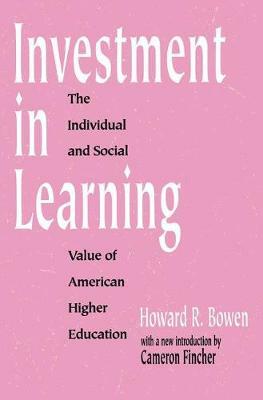 Cameron Fincher, in his new opening for the book, notes that "Publication of Howard Bowen's Investment in Learning was like a break in a long summer drought. . . . It was a comprehensive rebuttal to return-on-investment studies with negativistic findings." And in the foreword to the book, Clark Kerr simply says, "Howard Bowen is better prepared to survey the overall consequences of higher education in the United States than anyone else."